White House Proposes Merging Education And Labor Departments : NPR Ed The pitch goes all-in on workforce development and imagines a mobile-first platform for student borrowers. It's part of a proposal to restructure federal government. Congress would have to approve. 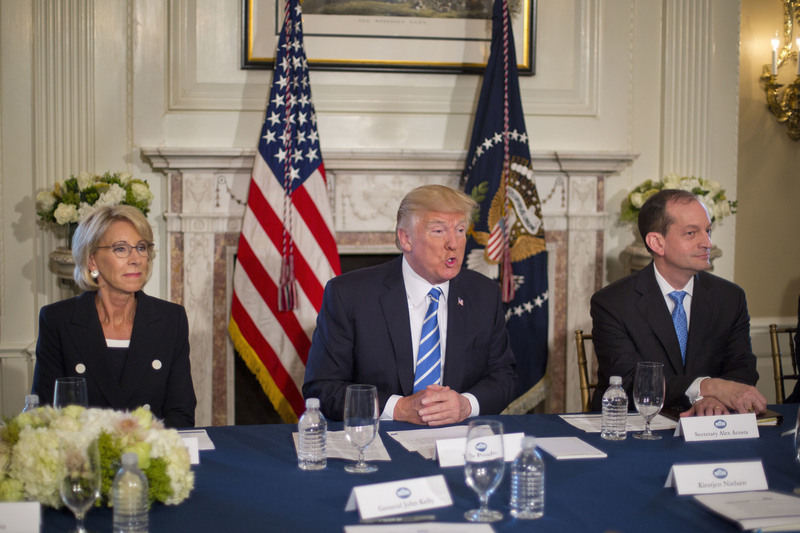 President Trump, flanked by Education Secretary Betsy DeVos and Labor Secretary Alexander Acosta, answers questions in August 2017 at Trump National Golf Club in Bedminster, N.J. Thursday, the White House announced plans to merge the two departments. The White House unveiled a plan Thursday to merge the Education and Labor departments into a single Cabinet agency: the Department of Education and the Workforce. The proposal is part of a 132-page document outlining a broad restructuring of the federal government. The changes would require congressional approval. The merger is part of a plan announced last year by Mick Mulvaney, director of the Office of Management and Budget, to "make government lean, accountable, and more efficient." It also reflects the administration's focus on career technical education and skill-building for today's students. The consolidation would create, within the new department, four subagencies, including one called the American Workforce and Higher Education Administration. This agency would, according to the proposal, "bring together current [Department of Labor] workforce development programs and [Department of Education] vocational education, rehabilitation, and higher education programs," eliminating some redundancy across multiple agencies. The proposal would also create subagencies devoted to K-12 education, research/evaluation/administration, and enforcement. The latter would enforce both worker protections and civil rights laws that protect the nation's students. "The federal government is long overdue for a serious overhaul," Rep. Virginia Foxx, R-N.C., the chairwoman of the House Committee on Education and the Workforce, said in a statement. "The proposed Department of Education and the Workforce is recognition of the clear relationship between education policy at every level and the needs of the growing American workforce." Foxx's Democratic counterpart on the committee, Rep. Bobby Scott, D-Va., said in a statement that "the Department of Labor is no more equipped to oversee elementary education policy than the Department of Education is prepared to enforce standards for coal mine safety. The logic behind this proposal is painfully thin." On the campaign trail in 2015, President Trump told Fox News Sunday host Chris Wallace that he would consider cutting the Education Department if elected. When he took office, he proposed major budget cuts, and his secretary of education, Betsy DeVos, has overseen a vast rollback of Obama-era guidelines that protect transgender students and advise colleges how to respond in the event of an alleged sexual assault. Recently, in the name of efficiency, the Office for Civil Rights began dismissing claims of civil rights violations. The Education Department currently employs almost 4,000 people and spends billions of dollars to help level the playing field for students from low-income families. It sends about $15 billion to K-12 schools that serve underresourced communities and roughly twice as much in Pell Grants to low-income college students. The new proposal would also task the current Federal Student Aid office with creating a "Next Generation Financial Services Environment" that would "emphasize a mobile-first, mobile-complete strategy — enabling and encouraging customers to fulfill all their needs on mobile devices." President Jimmy Carter established the Department of Education in 1979, and it began operating the following year. Trump isn't the first to attempt big changes there. During his presidency, Ronald Reagan tried to eliminate the department altogether, to no avail.